As you may have heard last week, the Vatican has placed American nuns in its gilded crosshairs, appointing a commission of American bishops to “reform” the Leadership Conference of Women Religious (LCWR). The LCWR is the nation’s largest umbrella group of women’s religious communities, representing some 1,500 communities that contain more than 80% of the nuns in the United States. The Congregation for the Doctrine of the Faith, formerly known as the Roman Inquisition, accused the nuns of having “serious doctrinal problems,” challenging official church teaching on homosexuality and the all-male celibate priesthood, promoting “radical feminist themes incompatible with the Catholic faith,” and making public statements that “disagree with or challenge the bishops, who are the church’s authentic teachers of faith and morals.” The CDF launched an investigation into LCWR in 2008; the results of that investigation were sprung on the group’s leaders last Wednesday when they were in Rome for what they thought was a routine visit. The Vatican also reprimanded Network, a Catholic social justice lobbying group founded by sisters. Both Network and the LCWR were cited for spending too much time caring for the poor and fighting economic injustice (topics that Jesus had quite a lot to say about, if my memory serves me) and not nearly enough time opposing — in fact, being “silent” on — women’s reproductive rights and LGBT equality (which, to my knowledge, Jesus never discussed at all). Translation: the men in dresses and pointy hats are in a snit because American Catholic women religious aren’t sufficiently homophobic and misogynistic. The hierarchy are trying to silence the voices of these brave women and force them to conform with their own Stone-Age views. The CDF’s criticism . . . seems intended to silence discussion of important issues in the church. Why are Vatican leaders afraid to hear what women religious think on topics such as homosexuality that is being so widely discussed in all other quarters of society? The Catholic faith is a living faith that requires dialogue and discussion, not only to thrive, but also to be a viable witness of God’s love in the world. If the leadership of the Catholic Church is unwilling to listen to the idea of the leaders of some of its most dedicated members, then our Church will never be able to grow or to respond in a Gospel way to the needs of our world. The CDF’s repressive action towards LCWR further erodes Catholicism’s ability to be a vital force in the world. We need to let our Sisters know that they are not alone, and that the Catholic people stand courageously in solidarity with them. If we want LCWR to respond with courage to this situation, we must en-courage the Sisters that we know and love. Jamie L. Manson of the National Catholic Reporter notes that the bishop appointed to do Rome’s estrogen control is none other than Seattle Archbishop Peter Sartain — the same prelate who recently made headlines when he asked all the parishes in his diocese to collect petition signatures in order to put Washington’s marriage equality law up to a popular vote in November. (Thankfully, some parishes have refused.) Coincidence? I think not. 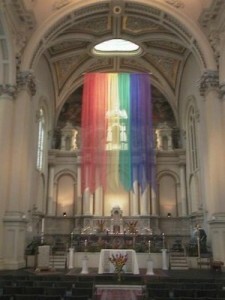 In today’s Catholic hierarchy, it’s becoming increasingly clear: bash the gays, get rewarded. With all due respect, we have come to celebrate Mass and not to be involved in a political campaign. We are all God’s children. Please do not mix our Mass with politics. Thank you. It’s likely that millions of [Catholic] dollars are being laundered into these political efforts. And it’s sad, but a reality, that the only possible way for faithful Catholics to ensure their money does not fund political attacks against their own LGBT family and parish members is to completely cut off funding to their parish. Catholics for Equality has created offering cards for churchgoers to place in the collection plate in lieu of cash or checks. The cards, which are to be signed by the parishioner, contain a promise to parish leaders that they will withhold all financial support until the parish formally denounces the anti-LGBT political activities of the United States bishops. It’s great to see such a forceful response to this unprecedented Vatican crackdown from pro-LGBT Catholics (who, by the way, constitute the majority of Catholics in the United States). Let’s hope the pressure continues.